NITRD Recruitment 2019 - Walk in for Junior Research Fellow Post on a project entitled “Tuberculosis among Paediatric household contacts of drug sensitive and multi drug resistant patients – A prospective cohort study”. in NITRD, New Delhi on Contractual on Co-terminus Basis. Candidates are invited by National Institute of TB and Respiratory Diseases to attend walk-in-interview to be held on 16 Apr 2019 11:00 AM for 1 vacancy. Post Graduate Degree in Basic Science with NET qualification or Graduate Degree in professional Course with NET qualification or Post Graduate Degree in professional courses. “Tuberculosis among Paediatric household contacts of drug sensitive and multi drug resistant patients – A prospective cohort study”. NITRD Recruitment 2019 - Walk in for Senior Project Research Fellow Post on a project entitled “Evaluation of the Efficacy and Safety of a Combination regimen of Bedaquiline, Delamanid, Linezolid and Clofazimine in Adults with Pre-extensive (Pre-XDR) and Extensively Drugresistant Pulmonary Tuberculosis (XDR-TB): Prospective Cohort Study” in NITRD, New Delhi on Contract Basis. Candidates are invited by National Institute of TB and Respiratory Diseases to attend walk-in-interview to be held on 23 Apr 2019 12:00 PM for 1 vacancy. 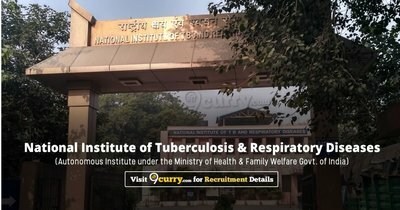 NITRD Recruitment 2019 - Walk in for Pharmacist, RA & Project Technician III (Field Worker) Posts on a project entitled “A Phase III, Randomized, Double-blind, Three arm Placebo controlled Trial to Evaluate the Efficacy and Safety of two vaccines VPM1002 and Immuvac(Mw) in Preventing Tuberculosis (TB) in Healthy Household Contacts of Newly Diagnosed Sputum Positive Pulmonary TB Patients” in NITRD, New Delhi on Contract Basis. Candidates are invited by National Institute of TB and Respiratory Diseases to attend walk-in-interview to be held on 23 Apr 2019 02:00 PM for 3 vacancies.